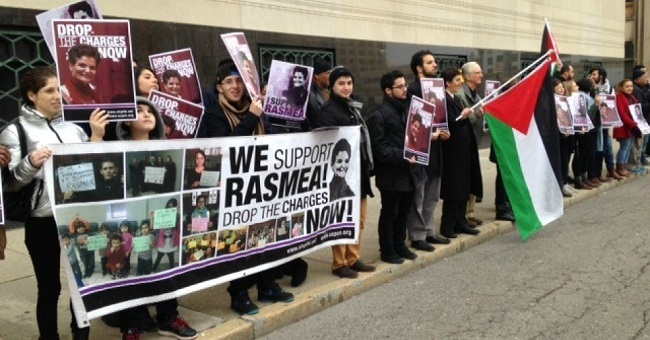 Stand with Rasmea and fill the federal courthouse in Detroit! Rasmea’s defense attorneys are arguing that she shouldn’t be imprisoned for even one more day, and over 70 important leaders of unions and community-based, faith-based, civil rights, and student organizations, as well as prominent academics and activists, who all wrote letters of leniency to Judge Gershwin Drain, agree. In addition, it must be made clear that Rasmea will be appealing the conviction regardless of the outcome of the sentencing, so visit the national Rasmea Defense Committee’s new website at www.justice4rasmea.org to help us fundraise for the appeal and learn of other action steps you can take. There is still much more organizing to be done! Visit www.justice4rasmea.org for more information, or email justice4rasmea@uspcn.org with any questions. The National Rasmea Defense Committee is led by United States Palestinian Community Network (USPCN), Committee to Stop FBI Repression (CSFR), and Coalition to Protect People’s Rights (CPPR); and includes 8th Day Center for Justice, Al-Awda NY: the Palestine Right to Return Coalition, American Arab Anti-Discrimination Committee (ADC)-Chicago, ADC National, American Muslims for Palestine (AMP), ANSWER Coalition, Anti-War Committee (AWC)-Chicago, AWC-Minneapolis, Arab Jewish Partnership for Peace and Justice in the Middle East, Arab Resource and Organizing Center, Chicago Alliance Against Racist and Political Repression, Chicago Light Brigade, Committee Against Political Repression, Council on American-Islamic Relations (CAIR)-Chicago, CAIR-Michigan, Friends of Sabeel-North America, International Jewish Anti-Zionist Network, International League of Peoples’ Struggle-U.S., Jewish Voice for Peace (JVP), Korean American Resource and Cultural Center (KRCC), Latino Organization of the Southwest (LOS), Lifta Society, Michigan Emergency Committee Against War and Injustice (MECAWI), Middle East Crisis Committee (CT), Milwaukee Palestine Solidarity Coalition, National Boricua Human Rights Network, National Lawyers Guild (NLG), National Students for Justice in Palestine, Palestine Solidarity Group-Chicago, Palestine Solidarity Legal Support, Palestinian Youth Movement-USA Branch, Samidoun Palestinian Prisoner Solidarity Network, St. Louis Palestine Solidarity Committee, United African Organization, United National Antiwar Coalition, US Campaign to End the Israeli Occupation, Voces de la Frontera, Women Against Military Madness (WAMM), and Z Collective.